Many Mac users track their events and tasks using iCal, but I don't know many who like having to keep iCal running all the time just to see upcoming events and pending to-dos. HashBang Industries’ iDeskCal is a nifty solution that puts your events and tasks right on your Desktop, so a quick glance—aided by Exposé if windows and apps are blocking your view—shows you what’s coming up and what’s due to be done. By default, iDeskCal shows several days of events, starting with today’s; you choose, in iDeskCal's preferences, which iCal calendars to view. For each event, you see the start time (All Day for day-long events), the event name, and, via a color-coded circle, the calendar to which the event belongs. (You can instead choose to color-code the event text itself.) How many days worth of events are visible depends on the size of the font, which you can customize, and the size of the iDeskCal display. You choose the size of that display by either manually entering dimensions and positional coordinates in the program's preferences or by resizing the area using the mouse. The latter approach requires you to enable a Make Dragable And Resizable setting and then relaunch the program. Unfortunately, this setting also adds a not-so-attractive title bar and border to the display area, so I recommend resizing and then disabling the setting (a change that, again, requires a relaunch to take effect). 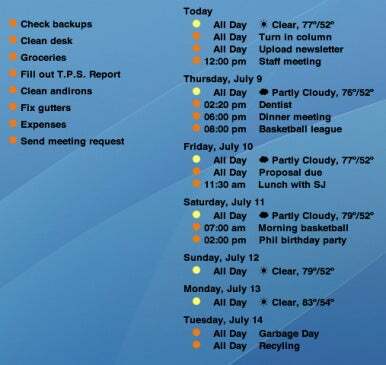 You can also choose to view your iCal tasks, which appear to the side of the calendar display and use the the same color-coded approach to indicate which task(s) belongs to which calendar. You can manage tasks—including adding new to-dos—by choosing the Manage Tasks item in iDeskCal’s menu-bar menu. This command brings up a floating window where you can “check off,” re-order, and edit tasks, as well as add new tasks. Like Today, iDeskCal provides quick ways—keyboard shortcuts and the menu-bar menu—to add calendar events and perform other actions without having to open iCal. Oddly, the default keyboard shortcut for Show/Hide To Dos is Option-right-arrow—the same shortcut used to move the cursor forward one word in every Mac program that handles text. It’s a shortcut I use hundreds of times each day, and for well over a week I couldn’t figure out why it was no longer working. Once I realized it was iDeskCal’s doing, I changed the shortcut in iDeskCal’s preferences. The other minor issue I experienced was that when I created a new calendar in iCal, that calendar wouldn’t show up in iDeskCal until I quit and relaunched the program. Similarly, after setting iDeskCal to display a calendar, the tasks for that calendar wouldn’t show up in the task-management window until I quit and relaunched. These are admittedly minor issues; most people aren’t regularly creating new calendars and disabling and enabling their display. Overall, iDeskCal is a handy utility that makes it easier to quickly see what’s up in your busy life. Want to stay up to date with the latest Gems? Sign up for the Mac Gems newsletter for a weekly e-mail summary of Gems reviews sent directly to your Inbox.